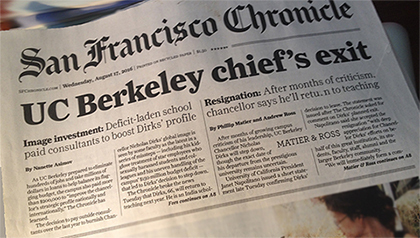 Dirks assumed the post in 2013, and has presided over a series of embarrassing scandals, from a tepid response to sexual harassment cases, to a $700,000 security fence around his house, to allegations of improper use of university resources for personal benefit. Earlier this year he narrowly avoided a no confidence vote by the Academic Senate. Napolitano has vowed to replace Dirks as quickly as possible. Students who work in Dining Services at UCLA are demanding equal pay for the same work as career staff, according to the Daily Bruin. Over 100 student workers have signed a petition saying that because their job duties are the same as career staff, they should be paid the same wages ($16.32 an hour instead of $10.50 an hour). Non-tenured faculty at the University of Illinois went from organizing to a strike to a contract in just two years, according to a new article from the American Federation of Teachers. They are part of a nationwide movement of mostly community college teachers, like those represented by UPTE-CWA, to change the conditions under which they labor. Excitement is building for UPTE’s administrative professionals’ organizing conference on August 27 in Los Angeles. If you haven’t yet registered, check out the details here or contact your UPTE local.